Objectives To provide information on the frequency and reasons for outcome reporting bias in clinical trials. Design Trial protocols were compared with subsequent publication(s) to identify any discrepancies in the outcomes reported, and telephone interviews were conducted with the respective trialists to investigate more extensively the reporting of the research and the issue of unreported outcomes. Participants Chief investigators, or lead or coauthors of trials, were identified from two sources: trials published since 2002 covered in Cochrane systematic reviews where at least one trial analysed was suspected of being at risk of outcome reporting bias (issue 4, 2006; issue 1, 2007, and issue 2, 2007 of the Cochrane library); and a random sample of trial reports indexed on PubMed between August 2007 and July 2008. Setting Australia, Canada, Germany, the Netherlands, New Zealand, the United Kingdom, and the United States. Main outcome measures Frequency of incomplete outcome reporting—signified by outcomes that were specified in a trial’s protocol but not fully reported in subsequent publications—and trialists’ reasons for incomplete reporting of outcomes. Results 268 trials were identified for inclusion (183 from the cohort of Cochrane systematic reviews and 85 from PubMed). Initially, 161 respective investigators responded to our requests for interview, 130 (81%) of whom agreed to be interviewed. However, failure to achieve subsequent contact, obtain a copy of the study protocol, or both meant that final interviews were conducted with 59 (37%) of the 161 trialists. Sixteen trial investigators failed to report analysed outcomes at the time of the primary publication, 17 trialists collected outcome data that were subsequently not analysed, and five trialists did not measure a prespecified outcome over the course of the trial. In almost all trials in which prespecified outcomes had been analysed but not reported (15/16, 94%), this under-reporting resulted in bias. In nearly a quarter of trials in which prespecified outcomes had been measured but not analysed (4/17, 24%), the “direction” of the main findings influenced the investigators’ decision not to analyse the remaining data collected. In 14 (67%) of the 21 randomly selected PubMed trials, there was at least one unreported efficacy or harm outcome. More than a quarter (6/21, 29%) of these trials were found to have displayed outcome reporting bias. Conclusion The prevalence of incomplete outcome reporting is high. Trialists seemed generally unaware of the implications for the evidence base of not reporting all outcomes and protocol changes. A general lack of consensus regarding the choice of outcomes in particular clinical settings was evident and affects trial design, conduct, analysis, and reporting. The recent scientific literature has given some attention to the problems associated with incomplete outcome reporting, and there is little doubt that non-reporting of prespecified outcomes has the potential to cause bias.4 5 6 Eight previous studies have described discrepancies with respect to outcomes between the protocol or trial registry entry of randomised trials and subsequent publications.4 7 8 9 10 11 12 13 14 In two of these studies,4 8 trialists were surveyed to ascertain the frequency and reasons for under-reporting outcomes. Although both studies had relatively low response rates, results showed that lack of clinical importance (7/23; 18/29), lack of statistical significance (7/23; 13/29), and journal space restrictions (7/23) were the reasons most often cited for under-reporting. A more recent retrospective review of publications and follow-up survey of trial investigators confirmed these reasons for non-reporting.15 However, information from self reported questionnaires suggested trialists often did not acknowledge the existence of unreported outcomes, even when there was evidence to the contrary in their publication. We undertook a study comparing the outcomes specified in trial protocols with those in published reports, and obtained detailed information relating to discrepancies from trial investigators by means of a structured telephone interview. Our objectives were to explore all discrepancies between outcomes specified in the protocol and those reported in the trial publication, identify cases of selective reporting of the set of outcomes measured, assess whether outcome reporting bias had occurred, and provide a more detailed understanding of why trialists do not report previously specified outcomes. We compared trial protocols with subsequent reports, and then conducted interviews by telephone with the trialists to obtain information relating to discrepancies. All interviews were conducted in English; because some of the investigators were overseas, we ascertained the feasibility of doing this with the researcher beforehand. The project was not required to be reviewed under the terms of the governance arrangements for research ethics committees in the United Kingdom. However, trialists were informed that confidentiality would be assured and all identifiable data from the interviews would be shared only by immediate members of the research team (AJ, JJK, PRW, and RMDS). The study reported here was part of the larger Outcome Reporting Bias in Trials (ORBIT) project to estimate the prevalence and effect of outcome reporting bias in clinical trials on the primary outcomes of systematic reviews from three issues of the Cochrane Library: issue 4, 2006; issue 1, 2007, and issue 2, 2007.3 To assess the risk of outcome reporting bias in this context, a classification system was developed and applied when a trial was excluded from a meta-analysis either because data for the review primary outcome were not reported or because data were reported incompletely (for example, just as “not significant”). The system identified whether there was evidence that: (a) the outcome was measured and analysed but only partially reported; (b) the outcome was measured but not necessarily analysed; (c) it was unclear whether the outcome was measured; or (d) it was clear that the outcome was not measured. One project researcher and the corresponding author of the review independently classified any trial in the review that did not report or partially reported results for the review primary outcome on the basis of all identified publications for that trial. We had intended originally to interview the investigators of trials where outcome reporting bias was suspected for the review primary outcome and match the interview to one from an investigator of a trial in the same review where there was no suspicion of outcome reporting bias. However, it became apparent early on that matching would not be possible owing to the low response rate. We therefore interviewed trialists from within these two groups without any attempt at matching. To reduce potential problems with recall, we restricted interviews to authors of trials published since 2002; therefore, trials published since 2002 from Cochrane reviews that included at least one trial where outcome reporting bias was suspected were eligible for the current study. We also drew on a second source, PubMed, and randomly sampled trial investigators from the 14 758 trial reports indexed on PubMed over the 12 month period from August 2007 to July 2008. We used the advance search option in PubMed and searched for randomised controlled trials in human participants that were published in English. We aimed to conduct interviews with the trial chief investigator, but also with the lead author where they were different. Several strategies were used to identify current contact details for these two groups of individuals. We began with the email address included on the publication. These email addresses were often no longer valid in cases where a considerable amount of time had elapsed between a publication and this analysis. In this situation, we tried to locate more recent publications by the same author by searching electronic databases. We then attempted to establish contact via the website or directory of the author’s institution, by contacting the journal in which the study was published, or by searching for the author’s name using an internet search engine such as Google. A further strategy if these measures were unsuccessful was to contact other authors the original author had recently published with to request contact information. Eligible trialists were contacted initially by an email from one of the study team (RMDS) informing them about the study and inviting them to take part in an interview. The trial protocol was requested at this point. One reminder was sent two weeks later to those trial investigators who had not responded to the first email. If no reply had been received within a month of first contact, we assumed the trialist did not want to take part and then consecutively invited coauthors to do so. Trial investigators who actively opted out (declined to be interviewed) were asked to nominate a coauthor who could be approached. To maximise our sample, all those eligible and in agreement were interviewed. Timing of the interview was therefore dependent on when the trialist or coauthor responded to the email. Given the lack of similar studies, it was difficult to estimate the number of trialists who would agree to be interviewed. To maximise information on reasons for discrepancies in reporting of primary outcomes, investigators from all trials included in a Cochrane review that were suspected of outcome reporting bias for the review primary outcome were approached for interview (n=85). In order to interview a similar number of trial investigators from the other two groups—that is, trials from the same Cochrane reviews that were considered to show no outcome reporting bias and the randomly selected cohort of PubMed trials—a further 98 and 85 trialists, respectively, were approached. The sample size was governed by pragmatic considerations relating to the number of eligible trials identified, the resources available, and the willingness of trial investigators to participate. Before interview, two researchers (RMDS and JJK) independently assessed consistency of the trial protocol with its related publication(s) to identify any discrepancies in outcomes. For each trial we reviewed all associated published articles. All trial reports were written in English; conference abstracts and posters were excluded. Unreported outcomes were defined as those that were prespecified in the trial protocol but were not reported in any subsequent publications. For each trial where selective outcome reporting was identified, an “aide memoire” for the interview was produced showing the outcomes prespecified in the protocol and the outcomes published in the trial report. An interview schedule was devised to identify factors influencing research reporting. The schedule had a chronological structure that followed the sequence of events for a trial: it started by establishing the research question and discussing the writing of the study protocol; moved to trial conduct; and finally went through the publication of the study findings. Where outcomes were not reported as specified in the trial protocol, we asked trialists to give an explanation and justification for their decision making and an account of how decisions were made. Trial investigators were also asked to provide the statistical significance of these unreported outcomes if the data were collected and analysed. The schedule comprised three broad areas of questioning: (a) specific questions relating to the presence of selective outcome reporting (that is, selection of a subset of the original recorded outcomes for inclusion in the trial publication (see below)); (b) specific questions relating to writing the manuscript and getting the paper published; and (c) general questions relating to publication bias. This current paper addresses the first of these areas; qualitative data obtained from the interviews that explore trialists’ experiences more generally of carrying out and reporting research will be reported in a separate paper. Trial investigators had a copy of the trial protocol and subsequent publication(s) with them at the time of the interview, as did the interviewer. Were data for the unreported outcome collected? What was the trialist’s perception of the importance of the outcome(s)? Why were data on the prespecified outcome(s) not collected? What did the trialist consider were the benefits, limitations, and difficulties associated with not collecting data on the prespecified outcome(s)? If data on the unreported outcome were collected, were they analysed? What did the trialist consider were the benefits, limitations, and difficulties associated with analysing prespecified outcome(s) data? Why is reporting all prespecified outcomes important? Why were the analysed outcome(s) not reported? What did the trialist consider were the benefits, limitations, and difficulties associated with not reporting the analysed outcome(s)? What was the statistical significance of the unreported analysed outcome? All interviews were conducted by a researcher with experience of qualitative research and of interviewing clinicians (RMDS). Two trialists requested, and were provided with, their interview transcript in order to add to or clarify issues and to ensure validity of the account produced; neither changed their accounts. Initially, we had not planned to exclude trialists on the grounds of first language. Three pilot interviews were performed with trialists from non-English speaking institutions whose first language was not English to assess the feasibility of carrying out interviews with such individuals, with respect to information given and interpretation. Email follow-up was then undertaken to verify the authors’ responses and our understanding of the information they gave. These interviews are included in the analysis. However, there was some difficulty eliciting data and information because of the language barriers, and follow-up questions were required by email. Given the resource implications of follow-up, we decided that inclusion should be limited to trialists working at institutions where English is usually spoken. Each interview was tape recorded with the trialist’s permission, transcribed, and anonymised. All the transcripts were examined in detail by one of the investigators (RMDS). At this stage interpretations were shared with two of the other investigators—one a medical sociologist with extensive qualitative research experience (AJ), the other a statistician with recognised outcome reporting experience (PRW)—both of whom read the transcripts independently. Data obtained from the trial investigators in response to the explicit questions relating to the presence of outcome reporting bias were of particular interest. Reasons provided by the trialists for not reporting prespecified outcomes were classified by the investigators (AJ, PRW, and RMDS). Categories for outcome reporting were preset and added to or modified as new responses emerged. Through discussion the investigators reached a consensus regarding the categories for classification of the reasons for discrepancies: (a) the outcome was measured and analysed but not reported; (b) the outcome was measured but not analysed; (c) the outcome was not measured; and (d) the outcome was reported but not prespecified in the protocol. A particular reporting practice was deemed to be associated with bias if the reason for non-reporting of an analysis was related to the results obtained; for example, if the result for the outcome was non-significant. For some trials from Cochrane reviews identified by the ORBIT project, we already suspected outcome reporting bias if trials did not report or partially reported results for the review primary outcome on the basis of all identified publications for that trial. For this reason, estimates of the frequencies of various discrepancies in reporting6 are based only on data from the randomly selected cohort identified from PubMed. However, the reasons given by the trial investigators for selective reporting are provided for all cohorts together. A total of 268 trials were identified for inclusion; 183 of these were from the cohort of trials covered in Cochrane systematic reviews and 85 were randomly selected from PubMed. One hundred and sixty one of the 268 respective investigators acknowledged receipt of our email, of whom 31 (19%) declined our invitation. For those authors who did not respond to emails, we were unable to ascertain whether this was because of incorrect or invalid contact information and hence non-receipt of our invitation. We were unable to obtain contact details for chief investigators or lead authors for 19 (7%) trials; however, we established contact with coauthors for eight of these. Thirty one trialists (including six coauthors) declined to be interviewed. The majority (17 trialists) gave no reason for doing so. Those who did provide reasons for declining cited personal circumstances (five trialists), work commitments (four trialists), and difficulty in recalling the trial (three trialists). One trialist did not wish to be interviewed by telephone, preferring email or written contact only. One trialist requested a copy of the ORBIT protocol, and subsequently declined to be interviewed. Overall, 130 (81%) trialists initially agreed to be interviewed (113 chief investigators or lead authors; 17 coauthors), but further attempts to establish contact and request their trial protocols proved unsuccessful for 30 of these. 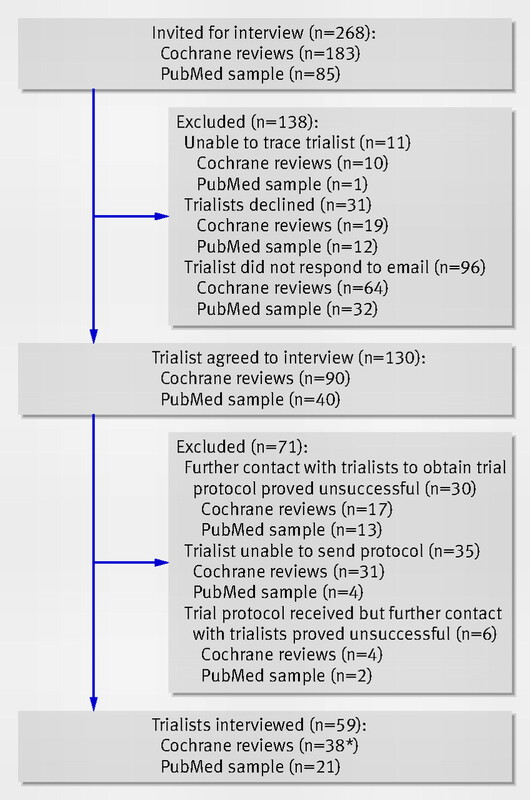 A further 35 trialists were unable to provide a copy of their trial protocol and so were not interviewed: 15 were unable to locate a copy, 13 were unable to disclose details of their protocol because of restrictions imposed by funding bodies (funded solely by industry), five had protocols that were not written in English, and two trialists were unwilling to share their protocol with us, both stipulating that it was a confidential document. Six further trialists agreed to be interviewed and provided a copy of their protocol, but did not respond to any further email contact. All those eligible and in agreement were interviewed. Overall 59 (37%) trialists, 38 identified from the cohort of trials from Cochrane reviews and 21 from trials recently indexed in PubMed, were interviewed (fig 1⇓). Characteristics of the publication(s) were compared between trialists agreeing (n=59) and those not agreeing (n=209) to be interviewed (table 1⇓). A higher proportion of trialists who did not agree to interview were funded by industry. There was some evidence that investigators for trials with reported involvement of a statistician were more likely to agree to be interviewed. There was no evidence of any association between a trialist agreeing to be interviewed and the sample size of the trial. Importantly, there was no evidence of an association between agreement rate and the level of suspicion of outcome reporting bias, as indicated by the two groups of trials identified from Cochrane reviews. Most interviews (48/59, 81%) were conducted with the trial chief investigator, eight of whom were PhD students. A further eight interviews were conducted with the lead author and three with a coauthor. Additional data were obtained at the time of the semistructured interviews to provide a descriptive summary of the sample. Characteristics of the interviewees and trials are shown in table 2⇓. Trialists were based in Australia, Canada, Germany, the Netherlands, New Zealand, the United Kingdom, and the United States. The median publication year was 2005 (range 2002-2008). In all but one case, interviews were performed with one trial investigator from each trial; for one trial we interviewed the chief investigator, lead author, and statistician simultaneously at their request. Interviews lasted on average 56 minutes (range 19-96 minutes). Forty three (73%) trialists sent their full study protocol for review. The quality of the protocols was highly variable, but all lacked some key information such as a clear definition of the primary outcome or a description of the statistical methods planned for the analysis. For the remaining 16 (27%) trialists, no complete protocol was available. Instead, six trialists provided the ethics committee application, two the funding application, one a summary of the full protocol, and three extracts from relevant chapters of doctoral theses. For one trial the protocol sent was simply a letter with the description of the trial that was sent to the funders. For two trialists the full protocol was available but not in English, so an English summary was provided. For the remaining trial we obtained an abridged version of the protocol from the clinical trials.gov website. In just under half of the protocols and substituted documents (27/59, 46%), one primary outcome was explicitly specified. In four (7%) protocols more than one outcome was specified, and in 28 (47%) none was specified. In three cases where a primary outcome was not explicitly stated, we assumed that the outcome used in the sample size calculation was the primary outcome; in two of these cases, this matched the stated primary outcome in the publication. In the remaining trial, the stated primary outcome in the report did not match the outcome on which the protocol sample size calculation was based. For three further trials where a primary outcome was not explicitly stated, we assumed that the primary outcome related to the main aim as stated in the research question in the protocol. Across the 37 trials with explicit (31 trials) or implicit (6 trials) primary outcomes, a total of 233 secondary outcomes were specified in the protocols (median of five, range 1-17). For the remaining 22 protocols where we could not deduce clearly which outcome was the primary outcome, a total of 132 outcomes were specified in the protocols (median of five, range 1-21). For the 59 protocols together, a total of 419 outcomes were specified; the median number of all outcomes specified was six (range 1-21). A statistical analysis plan was provided in 40 (68%) protocols. Inconsistencies of reporting were divided into those where an outcome specified in the protocol was omitted in the subsequent publication and those where an outcome presented in the publication was not prespecified in the protocol. All discrepancies identified across all 59 trials are included here. These categories are mutually exclusive for a particular outcome. Sixteen trial investigators failed to report a total of 30 analysed outcomes. For the majority (15/16, 94%) of the trials, this was judged to have led to biased under-reporting (table 3⇓). Although the decisions made by trialists not to report outcomes potentially induced bias, the information provided by trial investigators confirmed that, in all but one case (trialist 30), not reporting an outcome was unintentional. The most common reasons given by the trialists for not reporting outcomes were related to a lack of understanding about the importance of reporting “negative” results (trialists 12, 18, 22, 29, 44, 49, and 50), the data being perceived to be uninteresting (trialists 09, 18, and 36), there being too few events worth reporting (trialists 12, 39, and 41), and the need for brevity or perceived space constraints imposed by the journal (trialists 32, 34, and 56). There was deliberate misrepresentation of the results in one trial, in which a statistically significant increase in harm in the intervention group was suppressed. The investigator for this trial (trialist 30) described the difficulties presented by such a result, including the discussions the team had with each other and the wider clinical and research community, and the potential impact reporting the data would have had on service providers. Data on 26 outcomes over 17 trials were collected but subsequently not analysed. Most reasons given by the trial investigators were not considered to indicate bias (table 4⇓). However, in four trials, the direction of the main findings had influenced the investigators’ decision not to analyse all the data collected. In three of these trials, results for the primary outcome were non-significant and analyses of some of the secondary outcomes were therefore considered of no value (trialists 05, 39, and 44). The remaining trialist, after finding an increase in harm for the primary outcome, chose not to analyse a secondary outcome (trialist 59). Other reasons given by the trialists for not analysing collected outcome data included: inadequacies in data collection resulting in missing data (trialists 20 and 23); long term data not being available by the time primary outcome data were published (trialists 08, 23, and 43); delay in obtaining the data (trialists 40, 42, and 53); practical difficulties leading to uncertainty regarding the validity of the results (trialist 55); cuts in government funding meaning full analysis was not financially viable (trialist 15); a large volume of data presented in primary publication (trialist 45); and practical difficulties associated with the organisation of the trial (trialist 27). One trialist (trialist 41) had problems associated with not meeting the prespecified sample size, and an additional trial investigator (trialist 31) failed to analyse one outcome because the trial had a lower than expected recruitment rate (the prespecified sample size was 112, but only 54 participants were recruited), so the researchers decided to analyse fewer outcomes. Thirteen prespecified outcomes across five trials were not measured over the course of the trial. Reasons given by the trial investigators related to data collection being too expensive or complicated, as well as there being insufficient time and resources to collect less important secondary outcomes. An additional 11 outcomes were analysed and reported without being prespecified in the five respective trial protocols. The reasons that the trialists gave were associated with poor research practice and were attributed to shortfalls in the writing of the protocol. For example, one trialist acknowledged that only at the point of compiling the case report forms did they consider collecting data on the outcome, a decision that was mostly influenced by the fact that the outcome was routinely measured by clinicians. Estimates of the frequencies of various discrepancies in reporting are based only on data from the randomly selected cohort identified from PubMed, because trials identified from the ORBIT project were not randomly selected. In the 21 PubMed trials, the primary outcome stated in the protocol was the same as in the publication in 18 (86%) cases. Of these 18 studies, three were funded solely by industry, nine were not commercially funded, and six received funding from both industry and non-commercial sources. Discrepancies between primary outcomes specified in the protocol and those listed in the trial report were found in three trials. In one trial, the primary outcome as stated in the protocol was downgraded to a secondary outcome in the publication, and a non-primary outcome with statistically significant results (P<0.05) was changed to the primary outcome. One trial omitted reporting three prespecified primary outcomes and included in the publication a new primary outcome (P<0.05) not stated in the protocol. Both trials were not commercially funded. The remaining trial measured but did not analyse one of the eight prespecified primary outcomes; funding here came from both industry and non-commercial sources. A total of 159 outcomes were prespecified across the 21 trials. Across the 21 trials, 26 (16%) of the 159 outcomes were not reported, of which four were prespecified primary outcomes in two trials. There was at least one unreported efficacy or harm outcome in 14 trials (67%), of which seven (64%) were not commercial trials and seven (70%) had joint industry and non-commercial funding. Unreported secondary outcomes were either not measured (two trials), measured but not analysed (12 trials), or measured and analysed but not reported (eight trials). Four trials reported five outcomes that were not prespecified. Given the stated reasons for discrepancies, six (29%) of the cohort of 21 trials were found to have displayed outcome reporting bias—that is, non-reporting of an outcome was related to the results obtained in the analysis (trialists 39, 41, 44, 49, 50, and 56). Researchers have a moral responsibility to report trial findings completely and transparently.16 Failure to communicate trial findings to the clinical and research community is an example of serious misconduct.17 Previous research has shown that non-publication of whole studies or selected results is common, but there has been little previous research into the awareness among researchers of their responsibilities to publish fully their research findings or of the possible harm associated with selective publication. When comparing the trial protocol with the subsequent publication, we carefully distinguished the cases where an outcome was measured and analysed but not reported, measured but not analysed or reported, and not measured. There are two key messages from our work. Firstly, most unreported outcomes were not reported because of a lack of a significant difference between the trial treatments, thus leading to an overoptimistic bias in the published literature as a whole. However, we believe that non-reporting mainly reflected a poor understanding of how any individual trial forms part of the overall evidence base, rather than intentional deception. Secondly, from the reasons given for outcomes being either measured but not analysed or not measured, there was a general lack of clarity about the importance and feasibility of data collection for the outcomes chosen at the time of protocol development. We identified one study, however, in which the trialists intentionally chose to withhold data on a statistically significant increase in harm associated with the trial intervention. This type of “distorted reporting” in relation to adverse events has been previously described.18 The reported findings from the trial were published in a prestigious journal, and since publication the paper has been cited by others on a number of occasions. We have strongly encouraged the trialist to make these unreported results publicly available. We identified an apparent over reliance on the arbitrary but widely used cut off of 0.05 to distinguish between significant and non-significant results. In many cases trialists described subdividing P values into “significant” and “non-significant,” and deciding to not report “non-significant” results. Yet statistically significant results may not always be clinically meaningful. Likewise an observed difference between treatment groups might be clinically important, yet fail to reach statistical significance. Whether or not a finding is reported should not depend on its P value. Our work provides richer information on trialists’ decision making regarding selective outcome reporting than previous work has been able to capture. Previous questionnaire surveys asked trialists about any unpublished outcomes, whether those showed significant differences, and why those outcomes had not been published.4 8 15 Our work supports their findings and provides a more detailed understanding of why trialists do not report outcomes. Previous studies did not establish whether or not trialists intentionally chose to mislead by not reporting non-significant outcomes. Our study suggests deliberate misrepresentation of the results may be rare, although we cannot rule out the possibility that trialists may have framed their responses to our interview questions to hide intentional under-reporting of outcomes. An ongoing Cochrane review has identified studies that compare trial protocols with subsequent publications (K Dwan, personal communication, 2010). The effect of journal type was examined in one study but was not found to be associated with selective outcome reporting.12 The effect of funding source on outcome reporting bias seems to be heterogeneous, with studies showing that commercially funded trials are more (D Ghersi, personal communication, 2010), less,19 or equally 20 likely to display inconsistencies in the reporting of primary outcomes compared with studies that were not commercially funded. One study reported no effect of funding source on whether outcomes were completely reported, after adjusting for statistical significance (E von Elm, personal communication, 2010), whereas another found that commercially funded trials were more likely to completely report outcomes (D Ghersi, personal communication, 2010). For the 85 studies suspected of outcome reporting bias and the 98 studies assumed to be free of outcome reporting bias in this project, there was little difference between the groups in terms of sample size or the involvement of a statistician. However, there was some evidence that trials suspected of outcome reporting bias were more likely to not state their source of funding. The implications of our low response rate among trialists involved in commercial trials is not clear. It is possible that our results for the prevalence of outcome reporting bias are conservative, if those declining to be interviewed did so to avoid exposure of such bias with their studies. Recent work has shown the harmful effect of selective outcome reporting on the findings of systematic reviews3 and also the lack of awareness among people who conduct systematic reviews of this potential problem. Two recent initiatives are relevant here: firstly, the inclusion of selective outcome reporting as a key component of the new Cochrane risk of bias tool,21 which all review authors should be using in future to assess the trials included in a Cochrane review; and secondly, the recommendation to consider this issue when reporting a systematic review.21 We hope these developments will lead to greater recognition by reviewers and users of systematic reviews of the potential impact of reporting bias on review conclusions. The strength of our study rests in its use of interviews to provide valuable insight into the decision making process from the planning to the publication stage of clinical trials. Our study adds to the growing body of empirical evidence on research behaviour.22 Outcome reporting bias and publication bias more broadly could be viewed as forms of “fabrication,” according to the definition given by the US Office of Research Integrity. Our study leads us to agree with Martinson et al that “mundane ‘regular’ misbehaviours present greater threats to the scientific enterprise than those caused by high profile misconduct cases such as fraud.”23 Outcome reporting bias and publication bias more broadly were not explicitly mentioned in Martinson et al’s survey, however, suggesting that the scientists from whom the authors drew the specific misbehaviours to be surveyed were unaware of the harmful effects of selective reporting. It is important to acknowledge that the results presented come only from those trialists who agreed to be interviewed, and thus we urge caution in the interpretation of our study findings given the low response rate (trialists who declined our invitation or could not send their trial protocol were not interviewed). There is limited evidence relating to the factors associated with selective outcome reporting and even less with respect to outcome reporting bias directly, making an assessment of response bias in this current study difficult. It is possible that different methods—such as postal questionnaires—might have resulted in a higher proportion of trialists agreeing to be interviewed. However, structured telephone interviews were considered the most appropriate form of data collection when taking into account the aims of our study. The style of the interview allowed similar topics to be covered with each of the trialists, while still allowing the trialists to have flexibility in their answers. It allowed the prespecified topics to be discussed and explored in detail, as well as new areas or ideas to be uncovered. In addition, such interviews allowed the interviewer to check that they had understood the respondent’s meaning, instead of relying on their own assumptions. A further limitation of our work is the small sample size. All trialists eligible for interview were invited (n=268), of whom 59 (22%) finally agreed. Completion of interviews was governed by pragmatic reasons (the number of trialists who ultimately agreed), rather than when there was no extra data gained from the latest interview (data saturation). We are the first group to conduct interviews targeting instances of outcome reporting bias and protocol changes. Our findings add important new insights, pointing to a lack of awareness and understanding of the problem generally. Trialists seemed unaware of the implications for the evidence base of not reporting all outcomes and protocol changes. A general lack of consensus regarding the choice of outcomes in particular clinical settings was evident and affected trial design, conduct, analysis, and reporting. It has been suggested that comparing publications with the original protocol constitutes the most reliable means of evaluating the conduct and reporting of research,24 and the Cochrane Collaboration has recommended such comparison to detect if complete or incomplete reporting is indicated.21 It is widely believed that the introduction of trial registration would remove the practice of retrospective changes to outcomes, but a recent study has shown that there are frequent discrepancies between outcomes included on trial registers and those reported in subsequent publications.12 We have found that some differences between the protocol and the publication are a result of outcome reporting bias, but also that some changes are made during the course of the trial as a result of poor outcome choice at the protocol development stage. Such differences do not lead to bias. Our work suggests that for the assessment of reporting bias, reliance on the protocol alone without contacting trial authors will often be inadequate. Our findings emphasise the need to improve trial design and reporting. The recent update of the CONSORT reporting guideline25 includes an explicit request that authors report any changes to trial outcomes after the trial commenced and provide reasons for such changes. Readers can then judge the potential for bias. Unfortunately, in our study none of the reports in which trial outcomes were not measured, or were measured but not analysed, acknowledged that protocol modifications had been made. Our finding of a lack of understanding of the importance of reporting outcomes in various clinical areas lends further support to the development of core outcome sets.26 27 28 International efforts to develop consensus on a minimum set of outcomes that should be measured and reported in later phase trials in a particular clinical area would lead to an improved evidence base for healthcare. Contributors: The study was conceived by PRW, DGA, CG, and AJ. PRW, AJ, DGA, CG, and RMDS designed the study protocol. RMDS contacted the trialists to conduct the interviews. A comparison of trial protocols with trial reports was carried out by RMDS and JJK. Interviews were performed by RMDS. Analysis was performed by RMDS and JJK, with input and supervision from PRW and AJ. RMDS prepared the initial manuscript; PRW, AJ, DGA, and CG were involved in revisions of this manuscript. All authors commented on the final manuscript before submission. PRW is the guarantor for the project. Funding: The ORBIT (Outcome Reporting Bias In Trials) project was funded by the Medical Research Council (grant number G0500952). The funders had no role in the study design, data collection and analysis, decision to publish, or preparation of this manuscript. DGA is supported by Cancer Research UK. Dickersin K, Chan S, Chalmers TC, Sacks HS, Smith H Jr. Publication bias and clinical trials. Control Clin Trials1987;8:343-53. Kirkham JJ, Dwan KM, Altman DA, Gamble C, Dodd S, Smyth RMD, et al. The impact of outcome reporting bias in randomised controlled trials on a cohort of systematic reviews. BMJ2010;340:c365. Hahn S, Williamson PR, Hutton JL. Investigation of within-study selective reporting in clinical research: follow-up of applications submitted to a local research ethics committee. J Eval Clin Pract2002;8:353-9. Ghersi D. Issues in the design, conduct and reporting of clinical trials that impact on the quality of decision making. PhD thesis. School of Public Health, Faculty of Medicine, University of Sydney, 2006. Von Elm E, Rollin A, Blumle A, Huwiler K, Witschi M, Egger M. Publication and non-publication of clinical trials: longitudinal study of applications submitted to a research ethics committee. Swiss Med Wkly2008;138:197-203. Mathieu S, Boutron I, Moher D, Altman DG, Ravaud P. Comparison of registered and published primary outcomes in randomized controlled trials. JAMA2009;302:977-84. Al-Marzouki S, Roberts I, Evans S, Marshall T. Selective reporting in clinical trials: analysis of trial protocols accepted by The Lancet.Lancet2008;372:201. Ross JS, Mulvey GK, Hines EM, Nissen SE, Krumholz HM. Trial publication after registration in ClinicalTrials.Gov: a cross-sectional analysis. PLoS Med2009;6: e1000144. Moher D. Reporting research results: a moral obligation for all researchers. Can J Anaesth2007;54:331-5. Chalmers I. Underreporting research is scientific misconduct. JAMA1990;263:1405-8. Ioannidis JP. Adverse events in randomized trials: neglected, restricted, distorted, and silenced. Arch Intern Med2009;169:1737-9. Bourgeois FT, Murthy S, Mandl KD. Outcome reporting among drug trials registered in ClinicalTrials.Gov. Ann Intern Med2010;153:158-66. Ewart R, Lausen H, Millian N. Undisclosed changes in outcomes in randomized controlled trials: an observational study. Ann Fam Med2009;7:542-6. Higgins JPT. Cochrane handbook for systematic reviews of interventions. Version 5.0.2. The Cochrane Collaboration, 2009. Martinson BC, Anderson MS, de Vries R. Scientists behaving badly. Nature2005;435:737-8. Chan AW, Upshur R, Singh JA, Ghersi D, Chapuis F, Altman DG. Research protocols: waiving confidentiality for the greater good. BMJ2006;332:1086-9. Moher D, Hopewell S, Schulz KF, Montori V, Gotzsche PC, Devereaux PJ, et al. CONSORT 2010 explanation and elaboration: updated guidelines for reporting parallel group randomised trials. BMJ2010;340:c869. Cooney RM, Warren BF, Altman DG, Abreu MT, Travis SP. Outcome measurement in clinical trials for ulcerative colitis: towards standardisation. Trials2007;8:17. Clarke M. Standardising outcomes for clinical trials and systematic reviews. Trials2007;8:39. Sinha I, Jones L, Smyth RL, Williamson PR. A systematic review of studies that aim to determine which outcomes to measure in clinical trials in children. PLoS Med2008;5:e96.